The shiitake mushroom is a fungus that is full of potassium, phosphorus and vitamin B. The mushroom is a common ingredient in Asian cuisine, and an extract of the mushroom is often used to make medications to treat conditions such as high cholesterol. Although shiitake mushrooms are beneficial, some people can have an allergic reaction to them. 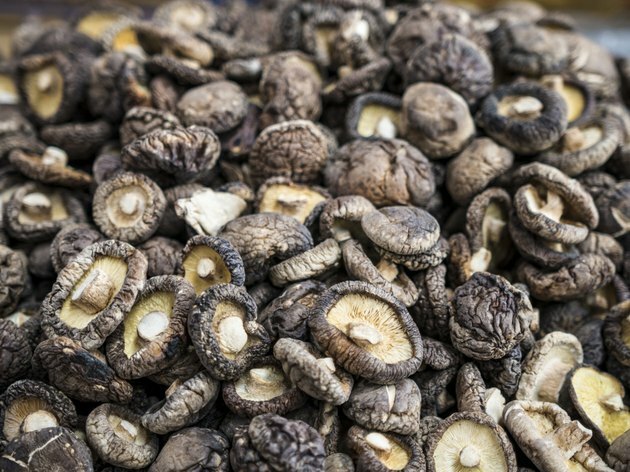 A shiitake mushroom allergy, also called shiitake dermatitis, is not typically life-threatening, but its symptoms can be uncomfortable and even debilitating. A toxic reaction, which isn't a true allergic reaction because the immune system is not involved, typically occurs when the body has a bad reaction to lentinan, a starch-like component in shiitake mushrooms. Lentinan can cause the blood vessels to dilate and release inflammatory compounds underneath the skin that trigger the symptoms of an allergic reaction. This reaction usually develops when the mushrooms are only partly cooked or consumed raw. Allergy symptoms can also be caused by a sensitivity to salicylates, which are chemicals found in every plant. In addition, you can experience an allergic reaction to shiitake mushrooms if you have an allergy to mold or fungus. A toxic reaction to shiitake mushrooms, which can mimic the symptoms of an allergic reaction, can include a red rash that is tender to the touch. Small, painful blisters can form over the rash. In addition to a rash, you may develop head pain, itching on the skin or in the mouth, nausea, puffiness in the face, swelling of the feet and hands, nasal congestion, stomach discomfort, a drop in blood pressure and asthma-like symptoms, such as difficulty breathing and wheezing. See a doctor if you suspect you are allergic to shiitake mushrooms. Your doctor may perform an allergy test to make sure that shiitake mushrooms are indeed the cause of your symptoms. With your doctor's approval, take an antihistamine to ease general symptoms and discomfort. Your doctor may also give you an oral or topical steroid to help relieve symptoms, such as itching and a rash. To prevent future allergic reactions, do not touch, eat or inhale shiitake mushrooms or any products that might contain salicylates or lentinan. In severe cases, a shiitake mushroom allergy can cause anaphylaxis, which is a life-threatening allergic reaction. Symptoms of anaphylaxis can include a severe drop in blood pressure, wheezing, extreme difficulty breathing, loss of consciousness and even organ failure. Call for emergency services immediately if you experience anaphylaxis after consuming shiitake mushrooms. If you are diagnosed with a severe food allergy to shiitake mushrooms, your doctor may ask you to carry injectable epinephrine with you at all times.